In the wake of four student suicides which occurred this past academic year at Ontario’s University of Guelph, community organizations throughout Canada are developing a renewed focus on meeting the needs of mental health challenges for students. Polly Guetta, development coordinator at the Mood Disorders Association of British Columbia, argues that early intervention is critical where mental wellness is concerned. Guetta defines poor mental health as a state wherein one’s ability to cope falls short of the demands being placed upon them, though acknowledges that not everyone who is experiencing a difficult time will have poor mental health. “Some people have the resources and the coping strategies to be able to deal with it. When those internal resources are not there to meet the demands, that’s when one’s mental health will start to deteriorate,” she says. Kwantlen Polytechnic University psychology professor and registered clinical psychologist Jocelyn Lymburner defines student mental health in terms of resiliency. She argues that students with good mental health are resilient against everyday stresses, can gain satisfaction from their existence, and are typically well-rounded individuals with healthy and rewarding social lives. Lymburner also notes that university can be a challenging time full of atypical stress. She argues that since the psychological diagnostic system has expanded over the years, and since we now pay more attention to mental health issues as a result, it is unlikely that students are reporting mental health problems that do not exist. Lymburner also urges students to seek help, even if they are unsure about the state of their mental health. However, it can be difficult for students to know for themselves when they are in need of help, and Lymburner says that there is certainly a question about where we might draw the line between disorder and normality. She argues that we must notice when our mental states provoke impairment and distress. If someone’s mental health stops them from having fulfilling relationships, completing work, or getting out of bed in the morning, she believes that is when they should seek help. The largest dataset on Canadian post-secondary health behaviours reveals some rather worrying trends about mental health across the country. In September, the Canadian Association of College & University Student Services (CACUSS) released the results of the National College Health Assessment survey, which reached more than 43,000 students from 41 Canadian institutions. Among mental health advocates, the results were reason for concern. Of the students who completed the survey, 13 per cent had seriously considered suicide within the last 12 months. During that period, almost 11 per cent of students who completed the survey indicated experiencing non-consensual sexual touching, and more than 10 per cent indicated being in an emotionally abusive intimate relationship. Meanwhile, less than half of those surveyed were categorized in the “flourishing” or positive mental health category. Rachelle McGrath, lead of the Healthy Campus team at Mount Royal University and a member of CACUSS, was involved in the national coordination of the Health Assessment and helped institutions conduct and review the results of the survey. “The survey in and of itself tells us the number or percentage of students experiencing health concerns, but it doesn’t necessarily get at that ‘why’ behind it,” she says. McGrath speculates that one reason why we are seeing an increase in diagnoses is because students are more comfortable with sharing their experiences with mental health challenges or illnesses than they have in the past. McGrath says that, while the role of post-secondary institutions should not be confused with that of health care services, it is imperative that institutions promote coping skills and resiliency through dialogue to help with student mental health. Gerald Walton, sessional instructor in the faculty of education at both Lakehead University and Kwantlen Polytechnic University, is empathetic towards students who need an escape from ongoing depression or anxiety. 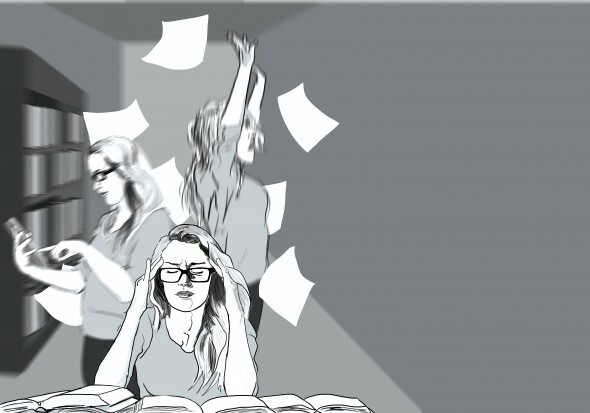 Nevertheless, he cautions against categorizing stress, which he suggests could merely be part of being an engaged student, as a mental health concern. Like McGrath, Walton puts part of the onus of mental well-being on educational institutions to support, accommodate, and validate student feelings and concerns. However, Walton sees stress for students as a necessary and potentially valuable part of the student experience that fosters decision making and critical thinking skills. She explains that addressing unhealthy thought processes—such as blowing things out of proportion and replaying events or thoughts continuously in one’s mind—is the role of cognitive behavioural therapy. Encouraging people to be more aware of their emotions and triggers, and how to best regulate and cope with destabilizing feelings, is part of the work that therapists do. In doing its part to support, accommodate, and validate student mental health concerns, KPU offers a variety of services. Free counseling services—accessible online at kpu.ca/counselling—where referrals for more specialized help can be made are what Senior Director of Student Affairs Joshua Mitchell calls “central” to the university. “We also have a peer support program, in partnership with the KSA, and the early alert program,” says Mitchell. The early alert program can be used by faculty members working with students experiencing difficulty to make a referral. In explaining the general decline in post-secondary student mental health, Mitchell says a “demographic shift,” or a spiked and more diverse participation rate, is a factor. “In terms of who is on our campuses, some students are better prepared for post-secondary life than others, and some have better supports,” he says. If you feel you are having issues with your mental health you are encouraged to contact KPU Counseling Services at their page on the KPU website. You can also send an email to peersupport@kusa.ca for more information.